The nation's leading health experts agree that eating at least five fruits and vegetables and being physically active almost every day promotes good health. In fact, research shows that health behaviors and patterns are established in childhood, and the consumption of fruits and vegetables has an enormous impact on future health outcomes. Too many children in our community don't get enough fruits and vegetables or get enough physical activity, based on studies done by the Dept. of Health. In the Minneapolis/St. Paul metro area: 6 out of 10 fifth graders eat fruit only once a day or less. 3 out of 4 fifth graders eat vegetables once a day or less. 3 out of 4 fifth graders are physically active for less than one hour a day. More than one in five boys and nearly one in seven girls in eighth grade are overweight. A generation is at risk. Experts agree that if something is not done to reverse these trends, children will, for the first time in history, have shorter life expectancies and more chronic illnesses than their parents. Let's Countdown to better health for everyone! 5 -- Eat 5 or more fruits, roots and vegetables every day. 3 -- Eat 3 meals a day. 2 -- Get 2 hours or less of screen time. 1 -- Get 1 hour of play or physical activity every day. 0 -- Drink 0 sugary drinks. The staff at ISLA would like to let the ISLA families know that we feel very appreciated! Thank you to Rosa Zavala and her mom for treating us to Salvadoran papusas on Wednesday, the PTO for Buca de Beppo on Monday and a lite breakfast on Friday and Adrienne Schnurr and one of her massage therapists for chair massages on Thursday. All of the flowers , cards, treats and well wishes have touched our hearts! We feel so appreciated and loved! It is finally time to reveal and kick off the nonprofit organization that honors Tucker Helstrom. Everyone is invited to the HOME OPENER of Team Tucker: Play Laugh Love. It will be a great event with celebrities, great food and an opportunity to learn more about my nonprofit that will create a legacy for my boy and our ISLA family member, Tucker. There are only 80 tickets remaining so it would be great if you ordered yours soon! See all the information below. Also, the Team Tucker store remains open and is taking orders. A new order is going in soon! Go to squareup.com/store/playlaughlove/ and get your Tucker Wear! Finally, and most importantly, THANK YOU for all of your love and support that continued even since Tucker died last July. Even without working there, I continue to be blessed with your empathy, sympathy, kindness and generosity that few grieving mothers receive even 9 months after the death of their child. I am so grateful that you, the ISLA Community, are my second family. 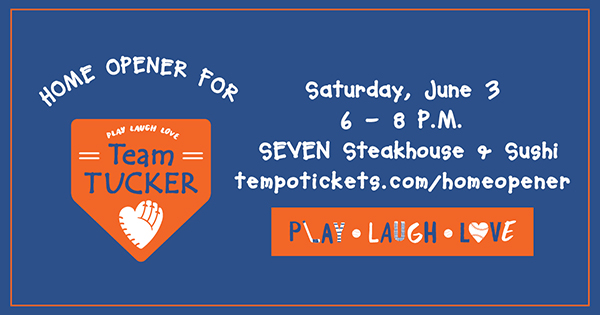 Join us for the "Home Opener" of Team Tucker: Play Laugh Love, an organization created in honor of Tucker Helstrom, on Saturday, June 3, from 6 - 8 p.m. at SEVEN Steakhouse and Sushi – a night of music, cocktails, decadent appetizers, and fundraising. Tickets are available at tempotickets.com/homeopener. Tucker was a 9-year-old boy who loved sports, laughing with friends and family, and caring about others. In the fall of 2015, Tucker was diagnosed with osteosarcoma, a rare form of bone cancer. Through five surgeries, a full leg amputation, and endless treatments, Tucker continued to be an athlete, teammate, loving friend, and devoted family member. Despite a heroic battle, Tucker died on July 2, 2016. Team Tucker: Play Laugh Love honors Tucker’s memory by providing children the opportunity to play sports in their community. Team Tucker volunteers will organize weekly “sandlot” baseball games in Hopkins and New Hope” during the summer. Children are encouraged to come play, laugh and feel loved. All baseball coaching, equipment and games will be provided at no cost to participants. The non-profit will also give every player a “Team Tucker” baseball, t-shirt and glove to keep. Every game will end with a healthy meal for participants and their families, which is critical during the summer months. Tickets to this fundraiser (must be 21-or-older) include heavy appetizers, a complimentary cocktail hour from 6 – 7 p.m. and additional products throughout the evening. There will also be an opportunity to meet, take pictures and get autographs from the following celebrities: Erik Haula, Kyle Rudolph, Jared Spurgeon, Alex Stalock, and Tucker's hockey hero, Jason Zucker. Additional celebrities attending will be announced until June 3rd.